Here is the 2009 draft order for the first 4 rounds and an explanation on how compensation works from the draft coverage of MLB.com. The former Club of a Player who became a free agent and ranks as a Type A or B Player shall be entitled to receive compensation in the form of a Draft choice in the First-Year Player Draft succeeding the Player's election of free agency. A Type A or B shall be a Player who became a free agent and ranks as a Type A or B Player under the statistical system of ranking Players set forth by the Elias Sports Bureau, using statistics based on a two-year average for each respective position group. Type A and Type B players necessitate that the Player's former Club receive a sandwich pick in between rounds one and two. Additional picks in the second, third and fourth rounds are exchanged from one club to another for the losses of Type A free agents. Type A Players now rank in the upper 20% of his respective position group by the Basic Agreement, instead of the upper 30% as was stipulated in the previous collective bargaining agreement. Type B Players now rank in the upper 40%, but not in the upper 20%, of his respective position group. Under the previous collective bargaining agreement, Type B Players ranked in the upper 50% not in the upper 30%. Before the most recent collective bargaining agreement took effect for the 2008 season, a Club would receive compensation for losing a Type C free agent. Under the new Basic Agreement, Type C free agents no longer call for a Draft pick as compensation. Dustin Ackley is the best pure hitter in the 2009 draft. He stands 6-1 tall, tips the scales at 185 lbs, bats left, and throws right. He's currently a draft eligible junior at the University of North Carolina. Ackley first caught my eye as a freshman at the University of North Carolina. Even though he was a 19 year old getting his first taste of collegiate ball, he still seemed like one of the best hitters in Division I. 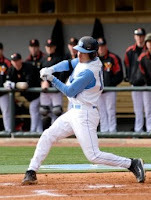 He hit a robust .402 with a .448 OBP and .591 slugging percentage....again, as a freshman. His performance has only improved as he has matured, posting a .417/.503/.597/1.100 as a sophomore and a .417/.520/.781/1.301 this season as a junior. He also added 21 homeruns and a 31/49 K/BB ratio for good measure. At this point, almost all the mock drafts project Ackley as the consensus #2 overall to the Seattle Mariners. Of course, he's not a lock to go #2, but it seems a pretty safe bet. Well, as safe as can be when the Mariners are involved, as they have a bizarre tendency to draft high upside starting pitchers only to convert them into relief pitchers. So, you never really know what they'll do. At the plate, Ackley has just about everything you want in a hitter. His bat speed is tremendous and he possesses great bat control as well. He can drive the ball to all fields and has no problem hitting the ball where it is pitched. He has a high contact rate and controls the strike zone very well. His strong pitch recognition prevents him from getting fooled and out on the front foot on breaking balls. There is debate about how his power will translate at the MLB level and he'll never be a big time power hitter, but at the very least he should be good for ~15 homers. Even if he doesn't sport more power than that, he will undoubtedly continue to be a pure hitter at the major league level. Here is a clip of Ackley hitting a grand slam despite breaking a metal bat on the pitch. Ackley not only possesses a tremendous hit tool, but he also has sneaky fast speed. Not only is he fast, but he also has good instincts on the base paths, which allows him to utilize his speed effectively. The one red flag on Dustin Ackley is that he had Tommy John surgery last summer, which limited him strictly to 1b in 2009. Ackley has the speed and defensive skill to play centerfield, but his arm injury has not allowed him to get back out there yet. That said, there is a good chance that he'll be able to revert back to centerfield in the future, which will only increase his positional value. Obviously, his bat would play better in center and any potential power shortage would cease to be a problem if he is able to move up the defensive spectrum. At this point, I'd be surprised if the Mariners didn't select Ackley. However, his well diversified offensive game and solid defensive skills would be a great addition to the Reds organization. The baseball draft is more susceptible to players sliding than the other major sports, so anything is possible, especially with so many of the top prospects being represented by Scott Boras. Ackley is a long shot, but he's worth keeping an eye on. Time to turn to the 2009 MLB Rule IV Draft. And, it's impossible to talk about the draft without talking about uber-prospect Stephen Strasburg. Strasburg is known to all, achieving the type of hype normally reserved for the top NFL or NBA draft prospects. Many have already labeled him the best pitching prospect of all time. His performance at San Diego State has been remarkable. He has the rare blend of plus power and plus control that define the very best pitchers. 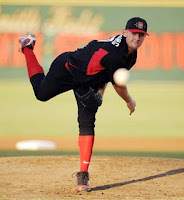 As a draft eligible prospect, Strasburg is mentioned in the same breath as Mark Prior and Brien Taylor, both widely considered to be among the elite pitching prospects of the amateur draft era. In 2003, Mark Prior had his epic season. He posted a stunning 2.43 ERA, 1.10 WHIP, 2.1 BB/9, and 10.4 K/9. Few pitchers possess the ability to control plus stuff. Prior was one. Strasburg might be the next. While Taylor and Prior are frequently used as comparables, they should also serve as cautionary tales. Despite their upside, both saw their careers derailed by injury. Unfortunately, the risk of injury is always lurking just around the corner with pitching prospects. Strasburg features a plus-plus fastball that can tickle triple digits. He also has the ability to maintain his velocity deep into games. He also features a nasty breaking ball. It's either a tight, sharp biting curveball or a slider. In his most recent outing against the University of Virginia, he spotted his breaking ball effectively on the outside corner on several different occasions. He wasn't just throwing a get me over breaking ball, but was hitting the catcher's mitt. He also utilizes a low 80s changeup, which has good action on it. His changeup is the speed of some MLB starters' fastball, but he still gets a 10+ mph differential between his fastball and the changeup, which makes it a very effective offering. Strasburg not only has the plus stuff and plus control that scouts droll over, but he also has the "ideal" pitcher's body type. He stands 6-5 and weighs in at 220 lbs after becoming a workout warrior at San Diego State. His height enables Strasburg to work on a downward plane. Some have raised concerns about Strasburg's mechanics, but it's hard to see any significant flaws. I wouldn't consider his mechanics flawless, but they do seem pretty clean. He coils his leg to build up energy and gets a solid push off the rubber. He incorporates his body well into his delivery, which should reduce the stress on his arm. Even so, I don't think he incorporates his body into his delivery as well as a Tim Lincecum. His arm action is pretty clean, though he does seem to get a bit long in the back and a bit whippy coming through at times. The main concerns raised about Strasburg's mechanics seem to center around the notion that he uses forced "scap loading" which increases his injury risk. Scapular loading is basically pinching your shoulder blades together before committing your shoulders to the target. It's a way of increasing velocity and some believe that done incorrectly it greatly increases the risk of injury. At this point, I remain unconvinced that Strasburg is at heightened risk of injury because of it. Personally, I tend to think that the best way for Strasburg to avoid injury is to learn to work effectively at less than 100% effort. If he can learn to be effective with his fastball sitting in the 92-94 range and dialing up increased velocity for big moments in the game, then I think he'll help reduce the stress on his arm. Looking around the game, it appears to be the max-effort pitchers who are always getting hurt, while pitchers like Greg Maddux, Livan Hernandez, Tom Glavine, and Jamie Moyer just continue to rack up the innings. Strasburg has more than enough velocity to be able to work effectively at less than max effort, which may do more to reduce his risk of injury than anything else. Anyway, here is a video clip of Strasburg in action, so you can decide for yourself. Unfortunately, Strasburg is a lock to go #1 overall to the Washington Nationals, so the Reds will have no shot at him. Even so, any discussion of the 2009 draft has to begin with Stephen Strasburg, who has the ability to go straight into the starting rotation at the major league level. Even when drafted by the Nationals, it'll be great fun to watch Strasburg pitch over the course of his career. I mentioned in the comments a couple of weeks ago that I would be a bit surprised if Kyle Lotzkar wasn't back and throwing by June 1. Sadly, not every surprise is a good one and that certainly holds true in this case. Back in the early part of 2009, Baseball America reported that last year Lotzkar was back throwing off flat ground just 1 month after the injury and didn't show any lingering effects during the instructional league. In addition, they recently reported that Lotzkar was being held back in extended spring training and would be joining a minor league team soon. Unfortunately, it now seems that Lotzkar has suffered a setback in his recovery. In fact, as often happens with this type of injury, Lotzkar may have reaggravated the fracture in the elbow. This qualifies as really bad news. At the time it happened, it appeared that it was a minor fracture that would not require surgery. However, it has yet to heal properly and if he indeed aggravated the fracture, then it could be the type of lingering problem that causes significant problems for a pitcher. I talked extensively about stress fractures in my write up of Kyle Lotzkar, which also mentioned the struggles Adam Loewen had with a similar injury. Ultimately, Loewen chose to give up pitching, rather than undergo another surgery, to focus on a career as a position player. Pitching is a very unnatural motion and it generates a significant amount of stress on the arm. Stress fractures are much more commonly found in the legs, which support the weight of the body. They are much more rarely found in the arm, but that speaks to the stress generated by the act of throwing a baseball at high velocity. Lotzkar's mechanics have always been a redflag and they are the reason why I have never ranked him higher in the prospect lists. Unfortunately, this injury is likely, at least in part, to be a result of his mechanics. Hopefully, he can bounce back strong from this injury and avoid a recurrence in the future, but the fact that this injury is lingering is a definite cause for concern. Lotzkar's setback further highlights the current lack of impact pitching prospects in the Reds farm system. Hopefully, they can address this shortfall in the upcoming draft or on the international free agent market. Well, I was just strolling through the baseball world today and came across a photo that seemed rather telling. Once in a while, a baseball photo will just jump out at me. Yes, this particular photo doesn't have anything to do with the Reds, but it struck me as being a rather telling photo. If you have seen southpaw Jonathan Sanchez pitch for the Giants, you know he has electric stuff that allows him racks up the strike outs. However, you'll also know that he struggles with his command. Given his struggles, you'd think the Giants would be looking long and hard at his mechanics and suggest a few changes. They have a highly regarded pitching coach in Dave Righetti, but I know where I'd start if I was making suggestions to Sanchez. It strikes me as ironic that the Giants haven't identified or remedied the potential problem, despite the fact that it is the same problem that afflicted a young Randy Johnson. Way, way back in the day, when the Expos still existed, they had a young, wild fireballer named Randy Johnson. RJ had yet to unleash his true potential and one day had a conversation with Hall of Famer Nolan Ryan. During that conversation, Ryan suggested to Johnson that he change the way his right foot hit the ground after his stride. Johnson had been landing on the heel of his right foot and Ryan suggested that he land on the ball of his foot. Landing on the ball of the foot increases stability and helps ensure more consistent mechanics. Johnson had been landing on the heel of his foot, which is more jarring and leads to less consistency in the mechanics. It's difficult to establish any consistency if you don't have a rock solid foundation. The Royals suggested a similar change to Gil Meche when they brought him over from the Mariners. It hardly seems coincidental that both improved their command and started to unlock their potential after the suggestion was made. To me, it seems a likely reason for his inconsistent command. If you land on your heel, then your foot still has to come down to the ground while your arm is coming forward. Here is a better look at why it may be problematic. In this photo, you can see just how far the front foot has to come down after his heel hits the ground. In addition, landing on the ball of the foot absorbs and distributes the shock of the impact much better than landing on the heel. The other problem I see is that his toe isn't pointed directly toward homeplate, instead it'ss pointed to the third base side of homeplate. This is probably an attempt by Sanchez to correct another flaw, which is that he throws with a cross-fire delivery, so opening his plant foot is likely an attempt to increase his ability to throw across his body. By doing so, he has to finish falling off to the third base side, which again can only hamper his control. Sanchez needs to stop using a closed off delivery by landing his plant foot more towards the third base side. In addition to moving the landing spot of his plant foot, his plant foot needs to land on the ball of his foot with the toe pointed directly towards homeplate. These changes would increase the stability of his delivery and help him drive directly towards homeplate, rather than having his momentum bleed off to the third base side of home plate. Anyway, that's what caught my eye for the day. Sanchez has been inconsistent, but a few mechanical changes might help him develop into a reliable top of the rotation starter. I have the DVR setup to record the San Diego State game tonight, so I'll likely kick off the draft coverage with a blurb on the famous Stephen Strasburg this weekend and then move into some of the candidates more likely to be selected by the Reds. In the Reds organization, one the brightest lights of the 2009 season is Zach Stewart. 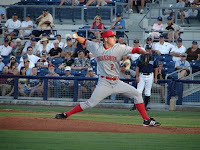 Stewart was drafted out of Texas Tech, where he worked primarily as a closer, but did log some time as the team's Friday night starter. When they drafted him, it seemed likely that the Reds envisioned him as a polished reliever who could move quickly up the ladder. Even if that's the role they envisioned for Stewart, they still put him in the starting rotation to start the season. It could be a sign that the Reds view him as a starter or it could be nothing more than a development strategy. Many organizations decide to use all of their best pitching prospects as starting pitchers, even if some ultimately project as being relievers. This is a player development strategy that allows the prospect to work long outings, develop additional pitches for their arsenal, and get regular work between starts. The main advantage is the last one, as prospects who work as relievers are unable to get consistent work in between appearances as they never know when they will be called on to pitch in the game. Regardless of the reason why he's in the rotation, now that he's there he may never relinquish the role. Stewart went to high-A Sarasota to start the season where he was truly overpowering. In 42.1 innings and 7 starts, Stewart posted a 2.13 ERA with a 32/8 K/BB ratio, 2.42 GB/FB ratio, and a 1.30 WHIP. He still features a nasty fastball and a hard biting slider, but as a starter he is working on a third pitch: his change-up. His slider always had plus potential, but early reports on it have been very strong. The other obvious plus in his early season performance is just how many ground balls he is inducing. His fastball has good sinking action to it and hitters are beating the ball into the ground, which is a big plus considering that he'll soon be pitching in the launching pad that is Great American Ballpark. His stellar early season performance for Sarasota recently earned him a promotion to double-A Carolina. He quickly proved that he brought his success with him, as he has yet to allow a run in his first two starts. In 11.0 innings, Stewart has a 0.00 ERA, 1.00 WHIP, 10/2 K/BB, and a 3.20 GB/FB ratio. Even though the jump from high-A to double-A is often considered the most difficult jump in the professional ranks, Stewart was clearly unfazed. Stewart made a start tonight which was notable in two respects: 1) He didn't allow a run and 2) he only pitched 4.0 innings. It's unclear why Stewart worked in only 4.0 innings, as he threw 7 in his double-A debut and was cruising tonight, so hopeful it's not an injury. I still worry that he may be a bit of a heightened injury due to his power stuff and pitching mechanics. 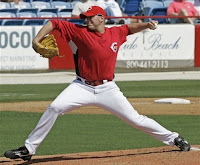 Here are a couple of photos of Stewart pitching for Sarasota (courtesy of Jim Donten) which were taken on April 22, 2009 when Stewart faced the Charlotte Stone Crabs. In the photo on the right, you can see that Stewart's plant foot is on the ground, but his pitching arm is not yet up in throwing position. A general rule of thumb is that the pitching arm should be up in throwing position when the stride is completed. Here, the arm seems to be a bit late, which could add additional stress to the arm. If the body isn't completely in sync, then the arm may have to carry more of the stress generated by the already unnatural act that is pitching. Hopefully, this isn't something that will hinder Stewart, but it does seem like his arm is still slightly lagging behind in his delivery. So far, Stewart's 2009 season has been an unqualified success. Given the lack of impact pitching prospects in the system, it's rather obvious that Stewart should be given every opportunity to prove his ability to handle a starting role. The Reds will likely select a pitcher in the 1st round of the upcoming draft, but for now Stewart is running neck and neck with J.C. Sulbaran for the title of best pitching prospect in the system. Well, that certainly went well. During his latest stint in the majors, Homer lasted 4.1 innings, giving up 6 earned runs, 6 walks, and 1 home run. Homer faced 22 batters, but only threw a first pitch strike to 8 of them. In addition, of his 95 pitches, only 3 resulted in swings-and-misses. It's difficult to fathom how someone who has been reputed to have plus stuff can have such difficulty avoiding bats. The other 92 pitches resulted in called strikes, balls, foul balls, or balls in play. To me, this result seemed entirely predictable. Despite his reputation as a flame throwing Texan, Homer has never flashed plus stuff at the MLB level and his lack of command only serves to compound the difficulty in avoiding bats. Homer is not ready for the majors and yet the Reds continue to hinder his development and eviscerate his trade value by bouncing him back and forth between the majors and the minors. It's difficult to see the decision to promote Bailey as anything other than shortsighted for two main reasons: 1) It was all risk and very little reward, and 2) You need to make the prospects earn their promotions. The vast majority of player personnel decisions are a balance of risk and reward, cost and benefit, downside and upside. Looked upon in those terms, the Homer decision was essentially all risk and very little reward. Homer's previous struggles at the MLB level had left him with greatly diminished trade value and revealed him to be unready to face major league hitters. Obviously, he needs more development time, which is why he was in triple-A to begin the season. In addition, his performance at triple-A Louisville was very uneven. For Louisville, Homer had a 4.57 ERA in 45.1 innings with a 43/17 K/BB ratio. Not bad, but not great. He has also allowed 9 home runs, which is rather disconcerting. When you add in his past difficulties at the MLB level, it was hardly the type of performance that would warrant a promotion. Not only was his performance not worthy of promotion, but there were other reasons why it made little sense. If the Homer had pitched well during his most recent promotion, then the Reds would have likely found nothing more than a solid back of the rotation pitcher for the remainder of the year. It's not likely that he would have emerged as the next Tim Lincecum or Zack Greinke. In addition, there would have been a small improvement in Homer's trade value. Still, the likely upside was minimal. Given that the Reds had other options for rounding out the rotation and the fact that Homer's trade value would likely have increased a similar amount if he maintained consistent success in the minors, it's difficult to see much of an upside or reason to justify the promotion. On the other hand, there was substantial downside to the promotion. If Homer pitched poorly, then his struggles would once again be on display, much of the positive momentum created in the minors would have been lost, and his trade value would once again be squashed into nothingness. So, it's fair to say that the downside was substantial. Given just how little there was to be gained from Homer putting up a quality spot start, it's difficult to understand why the Reds chose to promote him. In addition to the risk/reward balance tilting heavily towards the former, the promotion raises a legitimate question about the player development philosophy in use. You'd like to think that the Reds would force their prospects to EARN their promotions. What type of message does it send to the prospects who both work hard and perform well only to see the team promote bigger name, but lesser performing prospects? The one name that leaps to mind is Matt Maloney, who outperformed Homer at Louisville. Unfortunately, Maloney just never seems to be in the organization's plans and getting passed over this time probably only reinforces that idea in his mind. For Louisville, Maloney has a 2.28 ERA in 51.1 innings with a 41/7 K/BB ratio. In addition, Maloney has the advantage of being a southpaw, an attribute currently lacking in the Reds rotation. In terms of who has actually earned the promotion, you'd be hard pressed to make the case for Homer over Maloney. Given that Maloney is 25 years old and performing well at the highest level of the minors, it's time to give him an opportunity to pitch at the MLB level. At this point, maybe it's not fair to be at all critical of the organization. Maybe the blame should be laid entirely at the feet of Homer Bailey. In fact, it's getting closer to the time where we need to write off Homer Bailey entirely. We aren't there yet, as it makes no sense to cut ties or give him away in trade, but the Reds would be very wise to send him to Louisville for the rest of the season. The Reds need to come to two different realizations: 1) Homer is just not ready to be an effective MLB pitcher and 2) they are doing more harm than good by trying to force him into being one before he is ready. If the Reds are going to get anything of value out of Homer Bailey, then they need to let him continue to develop in the minors and force him to earn his way back to the majors. Constantly bouncing him back and forth between Cincinnati and Louisville is ruining any chance they have to get value out of Homer Bailey. Let's hope they don't do it again. Well, it's time to turn back the clock a decade to the year 1999. George Lucas had just started destroying the Star Wars saga with a new trilogy. Christina Aguilera was a Genie in a Bottle and Ricky Martin was living La Vida Loca. President Clinton survived an impeachment trial and the infamous blue dress. In the Queen City the Reds were still in the clutches of Jim Bowden and were just emerging from the long shadow of Marge Schott. However, Bowden was still relying on his familiar team building model, as he continued to pull reclamation projects off the scrap heap in hopes of forming a viable starting rotation. His most interesting effort during the 1999 season was former Atlanta Brave phenom Steve Avery. Steve Avery joined the Reds in 1999 after posting ERAs of 6.42 ERA in 1997 and 5.02 in 1998 for the Boston Red Sox. Avery needed a job and Bowden, as always, needed a starting pitcher. And, in the first month of the season, it appeared to be a match made in heaven. Avery started out white hot for the Reds. He made 5 starts in April, pitching at least 7.0 innings in all 5 games. As the calendar flipped over to May, Avery had a 2.02 ERA and a 1.07 WHIP in 35.2 innings. At that point, I was convinced. I bought into Avery hook, line, and sinker. I was convinced that he was returning to prominence, that he was back to the form that made him one of the most promising young pitchers in baseball. His velocity wasn't what it used to be, but I thought his change-up and guile were driving his success. Unfortunately, all was not what it seemed. Back in 1999, the wave of enlightenment created by statistical analysis had yet to reach the baseball world. At that point, most fans didn't yet have the tools to accurately evaluate the performance of players. As one of those fans, I fell under the spell of the white hot April that Avery posted. At the time, I wasn't able to identify the luck that went into his performance, but rather bought into the team dependent stats and the small sample size that made up his performance. The 2.02 ERA and 1.07 WHIP are very impressive, but modern metrics have revealed them to be poor indicators of actual performance. Now, looking back at Avery's performance, it doesn't take long to see it for what it was and what it ultimately proved to be: good luck. During April, Avery posted a lackluster K/BB ratio of 1.1. His strikeout rate was acceptable at 5.4 strikeouts per nine innings, but his walk rate was problematic at 4.9 walks per nine. Obviously, walking almost as many as you strike out is a red flag. In addition, there were other red flags. Obviously, his success didn't come from limiting runners who reached base via the base on balls and it didn't come from limiting contact, and hence base hits, through a high strikeout rate. No, Avery's success came from an absurdly fortunate hit rate. During the month of April, Avery sported a Batting Average on Balls in Play (BABIP) of .188, which should have been roughly .100 points higher. His good fortune could also be seen in his unsustainable strand rate, as he posted an April LOB% of 82.9%. His good fortune in hit rate prevented runners from reaching base and prevented those who did reach base from scoring. Not surprisingly, Avery's Fielding Independent Pitching (FIP) was only 4.36, which was much more reflective of his actual level of performance than his paltry 2.02 ERA. It's quite remarkable how much the way we view the game of baseball has evolved over the past decade. The new wave of statistical analysis has completely changed the way we look at the game, as it has altered the way players and performance are evaluated. It has brought a greater understanding of what is important and how all the individual events fit together to form the game. Looking back now, it's obvious that Avery was building castles in the sky, as his component statistics simply didn't support his level of performance. Unfortunately, at the time no one knew how to properly analyze a player's performance. Instead, improper weight was placed on his team dependent statistics. Unfortunately, but inevitably, the stunning April was ultimately revealed to be nothing more than a mirage. As the sample size increased, Avery came back to earth and was soon out of baseball. The great story of Steve Avery's comeback and reemergence was not to be and Bowden was left to scour the scrap heap for another reclamation project. Unfortunately, the great Steve Avery experiment didn't pan out, but at least now it will be easier for baseball organizations and fans to identify players whose great month of production is attributable to nothing more than good luck. This is an interesting read on Homer Bailey by J.J. Cooper at Baseball America, so I thought I'd just re-post it as is for your reading pleasure. It talks a bit about Homer's struggles and the changes he has made to increase his effectiveness at the MLB level. The mention about his curve ball, which was always reputed to be a "hammer curveball" and a "swing and miss pitch" is especially intriguing, as it has never been an effective or impressive pitch at the MLB level. Homer Bailey is no longer a prospect. He’s thrown 82 big league innings, which means he’s no longer rookie eligible. He first pitched for Triple-A Louisville in 2007, but he’s still there two years later after narrowly failing to beat out Micah Owings for the Reds’ fifth starter job. So you may be wondering why he’s showing up in a Daily Dish? For all of his Triple-A and big league experience, it’s easy to forget that Bailey just turned 23, which makes him younger than Rays prospect David Price. So we’re making an exception today, one we may make a couple of other times through the season to look at a former prospect who hasn’t made it yet to try to help figure out if he ever will. Watching Bailey’s most recent start on Wednesday evening against Wade Davis and the Durham Bulls summed up a lot of Bailey’s young career. His final line doesn’t look very good: 6 IP, 4 H, 4 ER, 0 BB, 4 K. But Bailey also showed some of the reasons that the Reds haven’t given up on him. Bailey retired the first 12 batters he faced, carrying a perfect game into the fifth until Johnny Gomes lost a fly ball in the lights and watched it fall 10 feet away for a double. He managed to get out of that jam, but an inning later he gave up a two-run home run to Jon Webber. An inning later he gave up another two-run home run to Chris Richard, ending his night. If you’re looking to make excuses for Bailey, it was a relatively dominating performance undone by two pitches. But then, it’s also fair to say that home runs have have been a problem for Bailey all year. He gave up only 10 home runs in 111 innings in Louisville last year, but he’s already given up nine home runs in 39 innings this year. That’s the bad news for Bailey. On the plus side, he is a different looking pitcher than the one that arrived in Louisville in 2006. Back then Bailey brought his hands up over his head before breaking them in his wind-up. He then stabbed some with the ball as he rared back and fired mid-90s fastballs. He has a much more compact motion now in an attempt to improve his once shaky command. He breaks his hands much lower and has reduced the stabbing motion in the back of his delivery. But according to Louisville pitching coach Ted Power, the biggest change is his stride. He used to have an exaggerated hip twist and an extremely long stride. He’s now shortened it because in his old delivery, when he tired he was prone to leaving the ball up in the zone. Bailey also throws a different assortment of pitchers. He added a slider last year out of necessity. When Bailey first debuted in the big leagues in 2007, he used a hard-breaking 12-to-6 curveball to compliment his 93-95 mph fastball. But Bailey’s curveball came from a different, higher release point than his fastball. At the big league level, hitters recognized that and simply let them go, waiting to get a fastball they could drive. "They would see the hand come up and they’d know it’s off speed, so they took it. Now his arm angle is the same for all of his pitches," Power said. The slider gives hitters something a little less recognizable to worry about, although he still will throw an occasional 75-79 mph curve (three by my unofficial count), as he showed against the Bulls. His changeup is a fourth pitch, although he throws it infrequently. The fastball sat at 92-95 mph last Wednesday, although he still ran it up to 98 mph at least once out of the zone. It may not be the Nolan Ryan-esque gas he once had, but he’s not far off his old velocity. And velocity has never been Bailey’s problem–if he’s ever going to succeed in the big leagues, he’ll have to show improved command. There are signs that the toned-down delivery is helping. For Louisville Bailey is throwing strikes on 65.9 percent of his pitches this season, compared to 62.8 percent in 2008 and 60.58 percent in 2007. Is it time for Paul Janish to start full time? There was an interesting blurb on MLB.com Reds Beat Writer Mark Sheldon's recent "Inbox." The title was the question: "Returning starters on short leash?" It's an interesting question and one that may need to be explored a bit further. Sheldon's answer was that Dusty Baker had already indicated that Alex Gonzalez and Edwin Encarnacion will both reclaim their starting jobs. I've expended enough energy talking about the litany of problems with Edwin Encarnacion at third. For now, the more interesting question centers around the shortstop position. In the article, Sheldon states that A-Gon will be the starter because he is "earning $5.3M" and "is one of the best defensive players around, even when he doesn't hit." At this point, it's fair to question whether that's still true. A-Gon missed more than a season with a compression fracture of the left knee. He didn't play a single game in 2008, so after all that time away it's a reasonable question whether he has lost a step (or two) to age, rust, and injury. As of now, A-Gon may not be the best offensive or defensive shortstop on the team. It's a small sample size for both, but so far Janish is vastly outpacing A-Gon in both aspects of the game. In 2009, Paul Janish is hitting .313/.389/.406/.795 in 37 plate appearances, whereas Gonzalez is hitting .171/.225/.280/.505 in 90 plate appearances. Obviously, each has less than 100 PAs, but Janish followed up his 23.3% line drive rate in 2008 with a 24.0% rate in 2009. I've always liked his short, compact line drive swing and his ability to control the strike zone. His BABIP is an unsustainable .400, but a high line drive clip will prevent it from falling too far. And, his ability to control the strike zone means that he would be valuable even if he hits .275, as that would leave him with a strong OBP. As for A-Gon, his walk rate is down (5.8% to 5.7%), his strike out rate is up (19.1% to 20.7%), his line drive rate is way down (21.9% to 16.9%), and his ground ball rate is up (34.5% to 40.0%). Maybe it's temporary and is caused by nothing more than rust, but it's not impossible that he's already in decline. On the defensive side, Janish is outclassing Gonzalez. Under UZR/150, which is the number of runs above or below average a fielder is on defense, Janish has a +14.4 at shortstop, while Gonzalez is scuffling along with a -13.3 rate. I'm not a math major, but if each player maintains that level of performance over the course of the season, then that would result in a net difference in run prevention of 26.6 runs. A win is considered to be worth roughly 10 runs, so that would be a 2.6 win difference going from Janish to Gonzalez. Under John Dewan's +/- metric, Janish is at +2 with a runs saved mark of +2, while A-Gon is at -4 and a -3 runs saved mark. Defensive statistics aren't perfect, but when multiple metrics reveal similar results it's easier to be confident in the results. At present, Janish not only has the advantage with the leather, but he also provides a significantly higher level of offensive production. Even if Gonzalez turns it around with the lumber, his offensive advantage over Janish would still likely be negligible. Obviously, the comparison is based on a very small sample size and is evidence of absolutely nothing, but at the very least the Reds should be keeping an eye on the situation. If Alex Gonzalez doesn't get it together soon, then a switch to Paul Janish could increase the team's win total by 2.5-3.0 games. If Gonzalez doesn't get it together, how long can a team without much margin for error continue to stick with him? Well, it's almost time to start looking forward to the draft, so may as well take a quick look back. In 2008, the Reds obviously adhered to the Best Player Available strategy when they selected Yonder Alonso. The Reds system was lacking true impact hitters and they immediately addressed that shortfall by selecting the University of Miami first baseman. Yonder was the choice despite the fact that they already had Joey Votto locked in at first base. It's a curious decision and I have to wonder if they would have made the same decision if Joey had performed at his 2009 level back in 2008. Would that have made a difference? Or, were the Reds planning on shifting Votto to left the entire time? Regardless, Yonder has wasted little time in establishing himself as one of the premier hitting prospects in the minors. In 2009, Yonder is hitting .281/.365/.477/.841 with a stellar 20/18 K/BB ratio. The slugging percentage isn't all that impressive, but he is playing in a pitcher's park in Sarasota, which is 6% more difficult to hit a homerun in than the average park. At this point, Y0onder may not quite be on the fast track that was expected, but he shouldn't be in the minors for long. The Reds appear to have drafted the impact bat that they wanted. The player that I liked most for the Reds in the last draft was Casey Kelly, who has the type of athleticism, power potential, and defensive ability that you rarely see combined at the shortstop position. While the "hit tool" was the largest question mark on Kelly and some scouts advocate never rolling the dice in the first round on a prospect with a questionable "hit tool," I still liked him more as a shortstop. Even so, I saw his pitching ability as a fallback option that would diminish the inherent risk that he might fail to develop as a hitter. Ultimately, Kelly was selected by the Red Sox, who have implemented a very interesting development plan for Kelly. 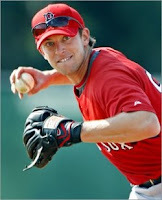 The Red Sox are using Kelly as a pitcher in the first half and will allow him to play shortstop in the second half. The Sox don't want Kelly throwing too many innings, so when reaches ~100 innings, the Red Sox will start using him as a shortstop. I'll be very interested to see how he performs in the field, but he'll have to be pretty effective if he's going to stave off a career as a pitcher. On the hill, Kelly has been dazzling for low-A Greenville. In 37.1 innings, Kelly has a 0.96 ERA, 2.04 GB/FB ratio, and a stellar 33/5 K/BB ratio. He's got the athleticism and tools to be a strong defensive shortstop with plus power, but it'll be interesting to see how much of an opportunity he gets to develop as an everyday player. He'll likely have to show something to avoid being switched to pitching full time sooner, rather than later. Nothing has had a bigger impact on the changing fortunes of the Reds as an organization than the resurgence of the farm system. As the draft gets closer, it'll be easier to get a feel for who the Reds might take, but at this point it seems a safe bet that they will continue to select the Best Player Available. In a draft that is short on top tier talent, it's the only strategy that makes sense for the upcoming draft. Unfortunately, Chris Valaika suffered a broken hand for triple-A Louisville. Valaika had been scuffling early in the season and this will only hinder his efforts to right the ship during the 2009 season. "Chris Valaika was placed on Triple-A Louisville's disabled list with a broken right hand. Valaika will be in a cast for four weeks. Between the injury and his early .161/.210/.290 line, Valaika won't be a candidate to solve the Reds' shortstop woes any time soon. He's not likely to see big league action before September call-ups." At this point, Alex Gonzalez and Paul Janish are doing a nice job holding down the shortstop position at the MLB level, so there isn't a pressing need for Valaika. However, it would be nice to see Valaika settle into a position full time and earn a promotion to the majors. Clearly, that will have to wait a while longer. Seemingly tired of his inconsistency and with players from the farm system making him redundant, the Reds recently shipped Jeff Keppinger to the Astros for infield prospect Drew Sutton. It hasn't taken long for Keppinger to impress his new squad, as he's off to a .435/.500/.739/1.239 start with the Houston Astros. Obviously, that's not a sustainable level of production, who long ago established his performance baseline. Keppinger is an early count, high contact hitter without much pop. He provides some defensive versatility, but his defensive value can accurately be described as being a "jack of all trades, but a master of none." In addition, as his service time increases, Keppinger salary also increases, so the Reds were obviously looking to shed salary and trade Keppinger's value for a younger model. Despite his hot start, it's clear what the Astros received in the deal, but what exactly did the Reds get? 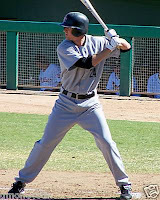 The Astros selected Drew Sutton 454th overall pick in the 15th round of the 2004 draft. Sutton was drafted out of Baylor University where he posted a line of .304/.387/.480/.867 with 8 homers and a 41/32 K/BB ratio. Sutton is a switch hitter who, at 6-3, is tall for a middle infielder. He has a long, lean body type and moves gracefully in the field with long strides. At the plate, Sutton uses a wider than shoulder width stance and still takes a small forward stride to transfer his weight and spread out even further. 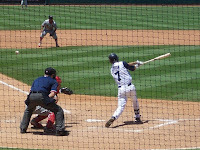 Sutton hits from an upright position with a high back elbow and gets good extension in his swing, which has a slight uppercut and produces line drives at a good rate. As for his hitting approach, he has good control of the strike zone and isn't afraid to let the ball travel deep in the zone. Sutton draws walks at a very good clip, but also generally makes solid contact when he offers at the pitch. In the field, Sutton is very versatile. Unfortunately, that's probably as much a result of his inability to master one position as it is his ability to play multiple positions. His range is rather stretched at shortstop and his bat probably doesn't play well at third, but his ultimate ceiling is that of an offensive minded second baseman who provides league average defense. Even if he doesn't reach his ceiling, Sutton could still prove to be a valuable utility player off the bench. Last year, Sutton really put it together and posted his best season as a professional. For double-A Corpus Christi, Sutton posted a stellar slash line of .317/.408/.523/.931 with 20 homeruns and a 98/76 K/BB ratio in 606 plate appearances. That type of production would make him one of the top middle infield prospects in baseball, but it needs context to be evaluated properly. In 2008, Sutton was repeating double-A after posting a .269/.351/.388/.738 with 9 homeruns and an 86/57 K/BB ratio in 558 plate appearances. In addition, Sutton was 25 years old, which made him a bit old for his level, so that cannot be discounted. Still, Corpus Christi is a fairly neutral park, so Sutton was still impressive. The power numbers get a bit of a boost in Corpus Christi, but Sutton earned his production with a rock solid 22% line drive rate. His stellar season came just in time to reinvigorate his prospect status, as his star was fading fast. In his career, Sutton has a .282/.377/.441/.818 slash line. It'll be interesting to see what happens in 2009, as Sutton has started his Reds career off with triple-A Louisville and his performance will provide an important data point. At this point, if I had to rank him, I'd probably slot Drew Sutton in at #21 just below Zack Cozart. If he can build off of his stellar 2008 season, then he could still prove to be a starter at the big league level. However, his age and league average (at best) defense will work against him, and may ironically leave him with a career similar to that of Jeff Keppinger. Even so, it was a good acquisition by the Reds, as middle infielders with plus on-base skills don't grow on trees and Keppinger simply no longer had a defined role with the Reds. Well, I'm going to shorten up this year's version of the All Undervalued Team. Last year's version had a few hits (Jayson Werth, Brian Wilson), a few misses (Morgan Ensberg, Sam Fuld), and a few guys who may yet make an impact (Kevin Correia, Matt Murton, Kevin Frandsen). Even so, I thought I'd take another swing at if for 2009. Anyway, here are a few guys I like for 2009 and beyond. In Texas, Jarrod Saltalamacchia is the catcher of the present, but Teagarden is the catcher of the future. It'll be interesting to see how it all shakes out, but I'd be surprised if Teagarden doesn't supplant Salty sooner rather than later. Teagarden's current problem is contact rate. He strikes out a great deal, which will likely prevent him from posting any .300+ batting averages. However, he has very good offensive upside, as he features plus power and controls the strike zone very well. He also has a very smooth, effective swing for a righthanded swing. On defense, Teagarden is very strong. He has good footwork, which gives him good lateral movement behind the dish and helps quicken his release against would be basestealers. At this point, his ability to make contact will determine his career path at the MLB level. If he can improve on it, then he could prove to have a few All Star seasons in him. Even if he doesn't, he should prove to be a very solid MLB backstop for years to come. It'll be interesting to see if can supplant Salty or if the Rangers trade him away for much needed pitching. Either way, it shouldn't be long before he is strapping on the "tools of ignorance" full time at the MLB level. Kila had a massive 2008 season in which he slugged .600+ at double-A and triple-A. Kila is not a very athletic player and lacks foot speed. However, his calling card is skill at the plate, as he has plus power and strike zone control. Last year, Kila jumped three levels, starting at double-A moving to triple-A and finishing out the year with a cup of coffee in the Majors. During his time in the minors, Kila posted a combined line of .314/.456/.628/1.085 with 37 homers and a stellar 104/67 K/BB ratio. It's rare to see a power hitter who walks more than he strikes out in the modern game, but Kila certainly has that ability. Critics have pointed to the high percentage of his extra base hits that are homers, thinking that the low number of doubles indicates that his power surge isn't for real or sustainable. It remains to be seen whether 2008 established a higher baseline of performance or was more of a Chris Shelton type fluke season. At this point, it's difficult to say which, but it's difficult to ignore a player with such a high walk rate and moderate strikeout rate, especially when he packs the kind of power that Kila possesses. Donald is a personal favorite of mine. He's the type of player whose production outpaces his tools. The type of player who almost seems to will himself to success. The Phillies selected him in the 3rd round of the 2006 draft out of the University of Arizona. He uses a patient approach and controls the strike zone, but is aggressive when he gets the count in his favor. He has a good line drive stroke that produces sneaky power and he plays an intelligent game. Donald has defensive versatility, but would likely be stretched at shortstop. He profiles best at second, but he will likely hit enough to hold down the hot corner as well. Unfortunately, he is currently blocked in a major way by Chase Utley, Jimmy Rollins, and Pedro Feliz. It'll take a trade to land him a full time job, but he should be very solid when he gets one. Tuiasosopo seems to have figured it out. He comes from a very athletic family, but like many pure athletes he has struggled to translate that athleticism into production. However, he seemed to turn the corner in 2008. He posted a line of .281/.364/.453 for triple-A Tacoma, but finished up strong with a .303/.380/.538 line in the second half. He has a good work ethic and a strong defensive skill set. He also has the ability to control the strike zone, but until recently he lacked any pull power and utilized an inside-out swing. Now that he is more adept at turning on the ball, he is driving it with greater authority. He'll never be a big time homerun hitter, but his well diversified skill set still gives him good value. Incumbent Adrian Beltre is a free agent after the 2009 season, so Tui should be in line for the starting 3b job in 2010. Lowrie was going to be my choice here, so I'll stick with it despite his wrist injury. He's got a very well-rounded game and a high baseball IQ. When he gets healthy, he should be a very productive offensive shortstop who is no slouch with the leather. If the BoSox are unwilling to make room for Lowrie at short, then I'd love to see the Reds acquire him. That said, since his injury will knock him out for much of the season, I'll offer up a replacement nominee. I'm still a fan of Paul Janish and think he could be a sneaky valuable shortstop. His offensive game projects as being potentially valuable enough to warrant making him a starter. An above average defensive shortstop who can get on-base is a valuable commodity. Yes, despite the slow start, I'm sticking with Dickerson. Obviously, he's still a bit raw, but all the tools are there. At this point, he needs to make an adjustment or two, but I find it difficult to believe that someone with his skill set and beautiful swing can't hit .260 at the MLB level. If he can hit .260, then his power, speed, and ability to control the strike zone would make him a very valuable player. At this point, it's unclear whether he will ever reach his potential, but hopefully the Reds will give him a big enough sample size to prove it one way or the other. Spilborghs may get squeezed out of the crowded Colorado outfield, but he is certainly deserving of a starting job. He can capably handle all three outfield spots and provides solid offensive production. He hits line drives at a good clip and gets on-base at a good clip. He lacks elite power, but he would like mighty good in leftfield for the Reds. Choo is an interesting player and one that has flown almost completely under the radar. This is the season where he is getting a much bigger opportunity to show what he can do. On his career, Choo has a slash line of .286/.381/.484/.865 and a line-drive rate of 23.3%. He seems a likely candidate to have something of a breakout season in 2009, as his production is about to meet with greater opportunity. He struggles a bit against southpaws, but most young lefthanded hitters do. It's time for a confession, back in 2005 the prospect that caught my eye the most in the draft was Ricky Romero. In the 2005 draft, you couldn't swing a dead cat without hitting an impact prospect in the first round, but Romero was not among them. That draft class included Jay Bruce, Cameron Maybin, Ryan Braun, Ryan Zimmerman, Chris Volstad, and others. Still, Romero was an impressive southpaw at Cal State Fullerton. He seemed polished and ready to move quickly up the ladder, but his progress has been slowed by injury and ineffectiveness. However, that seemed to change when the Blue Jays kept him in spring training to work on his mechanics. After some mechanical adjustments, Romero seemed to be the pitcher of old. He features a fastball that sits at 90-91 and touches 94, but his best pitches are a power curveball with a sharp, tight break to it and a very deceptive change-up. His 2009 season has been impressive to date, but unfortunately he was put on the DL with a strained oblique. It'll be interesting to see which Romero shows up when he returns from the DL, but he may finally be ready to reach his unrealized potential. Perry was drafted out of the University of Arizona in the 2008 draft. He has a huge arm, which produces a fastball that can touch 100 mph on the radar gun. He also features a power slider that at times can be a put away pitch. The Tigers continued their practice of being very aggressive in promoting their prospects, as Perry made the team out of spring training after only throwing 14.0 innings at the minor league level in 2008. Perry could quickly take over the closer role for the Tigers, but for now he is being used carefully by skipper Jim Leyland. Still, if he continues to develop his secondary pitches and refines his command, Perry should be a very effective reliever who can work high leverage innings. Well, this is very cool. Someone posted this over on the message board, but I thought it was worthy of being passed on to everyone. Someone was able to take single frame photographs of the pitching motion of Mordecai "Three Finger" Brown from the Library of Congress archives and put them together to create a video clip of his pitching motion.